I love vintage designs. See that cute framed postcard? Keep reading. I always start with my kitchen island. I have a wood tray (similar to this one or this one) that sits on my island. I change it up for each season and or holiday. I do this for me. I stand here with this view and it makes ME happy! I’m the one that is home most often. I’m the magic maker and I deserve to light the candle and enjoy the decor. For most holidays, this is all I do—decorate my kitchen tray. But, I always start here. I painted this candy corn trio back in 1994-ish and it has hung on the hooks of our weekly blackboard calendar for as long as we’ve lived in this home. The other two are from the Target dollar spot a few year back and they sit on the narrow shelf. There are certain decorations, that I’ve had forever and they MUST go in the same location year after year. These familiar elements invite happy memories and create that strong sense of connection for my kids. This lighted jack-o-lantern is old, but I decided to pull up my little turquoise table and create a cute little corner by the front door. While there are those few items that must stay put, I am very interested in changing most things up from year to year. THIS IS THE THING that gets me excited. This is what I observed on the weekend—I thrive on change! After all, its the new and novel that piques curiosity and creates anticipation! Change (of course!) requires shopping. Once I’ve got things underway then I start envisioning what I might need and what size or shape it should be. For example, when I got the idea that I could bring up my little light blue (Easter) table, I tried my plug-in jack-o-lantern on it—but I knew it would need to be up higher and I also sensed I would need a floral something or other that would need to be even higher than that! I had such FUN yesterday morning at Hobby Lobby figuring this all out. Its like a puzzle but BETTER. Start with what you already have and then seek inspiration to find new solutions! For me, it’s all about the front porch. This is especially true at Halloween because all those cute costumed kids will see your porch and know what to expect. I am particularly fond of the littles and I want my porch to be inviting and safe for them. Plus, a tidy, happy porch is the best introduction to your home and family—so grab your broom—sweep first and decide how you can create a welcome scene! You can convey a great deal of holiday cheer with a few touches in the corners and on window sills and table tops. Small areas = BIG results. Some years you won’t have the time or energy to go all out, but you can still decorate and make a difference. One more thing—specific to me and Halloween. I don’t like scary. I don’t do skeleton’s (except for my exceptionally CUTE Mr. Bones on the porch!) I don’t like dead things or creepy noises. I hated haunted houses as a child and dreaded college dates during the month of October—for fear my date would pick me up and say, “Let’s go to the haunted house!” Nope. Not me. No way! 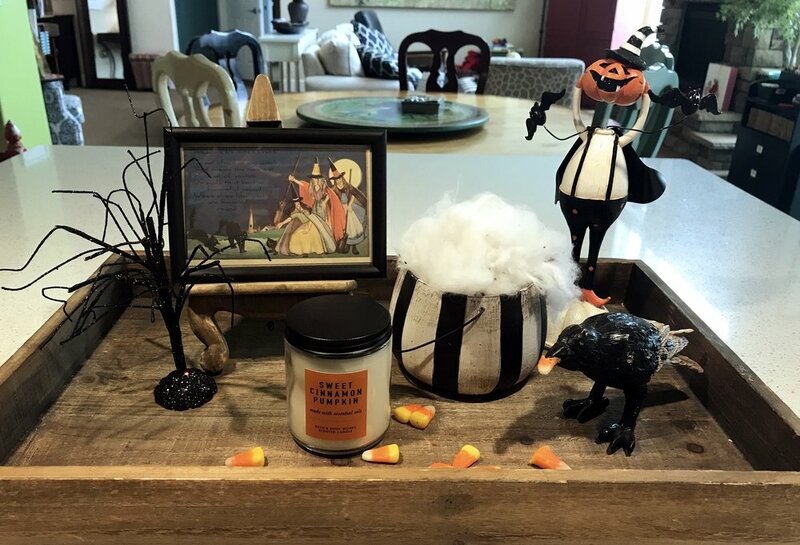 I like Halloween that is cute and colorful and vintage. Speaking of vintage, did you know you can download FREE images from the New York Public Library’s archives? 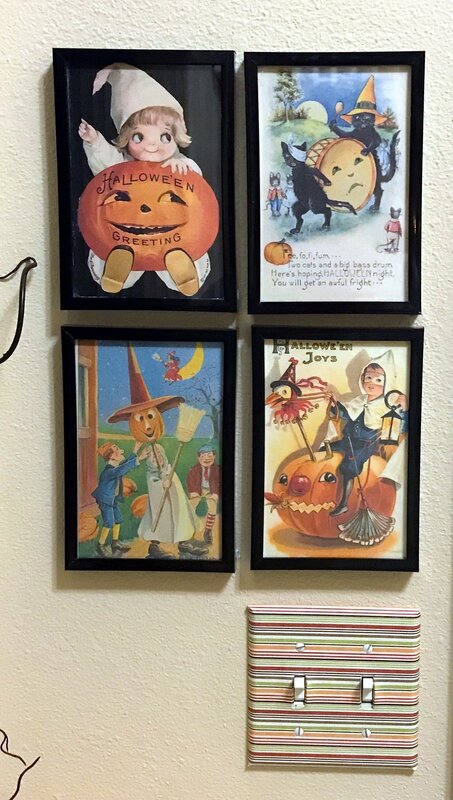 Click on the link and search “vintage Halloween” and you’ll find all kinds of old time whimsical postcards and photos to print and decorate with or give away with goodies. NYPL also has a Flickr account. I selected several to print and frame by my front door and I used one on my kitchen tray as well. As a final finishing touch, I covered my light switch plate with some pattern paper from my stash. Easy, affordable decorating with some insightful tips.